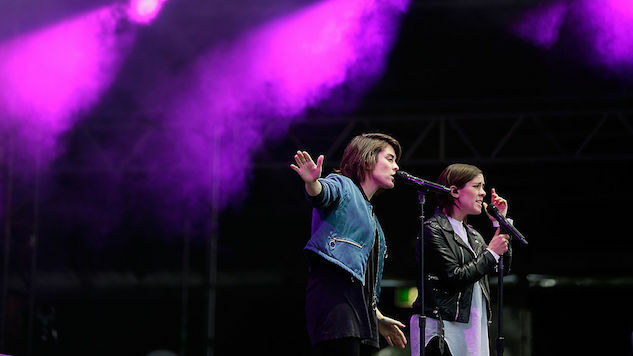 Reaching 10 years for any kind of anniversary is a huge milestone—that’s why Tegan and Sara are going all out to commemorate this year’s birthday (July 24) for their 2007 breakthrough record, The Con. The twins previously announced that they would embark on an intimate, acoustic tour of the album this fall, and now, they have revealed the tracklist for their second celebratory project: a reissue of the album featuring covers of each song by other artists. The contributors list is one for the books. The duo enlisted the likes of CHVRCHES, Paramore’s Hayley Williams, Ryan Adams, Trashique (a collaboration between Grimes and Hana), Cyndi Lauper and more to take on their renditions of a Tegan and Sara original. The Con X: Covers will be out digitally Oct. 20, with a vinyl release on Dec. 22. Preorders will begin Sept. 19. Check out the tracklist for the album below, and see the dates for The Con X: Tour here.